Bamboo sticks are the weapon of choice for the Gulabi Gang, a pink sari-clad group of female vigilantes based in the northern Indian state of Uttar Pradesh. Bamboo sticks, or lathis, are a formidable weapon. In the hands of these angry women, the bamboo sticks are a rather effective way of encouraging change in a region where women have been victims of social oppression for centuries. 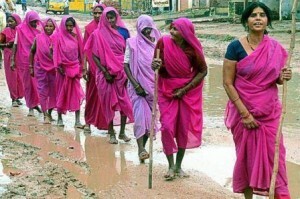 The Gulabi Gang, drawn from the dalit (untouchables) caste, was started in 2006. It was initially formed to punish oppressive husbands, fathers and brothers, and combat domestic violence and desertion. In 2008, they stormed an electricity office and forced officials to turn back on the power they had cut in order to extract bribes. New recruits to the gang are trained in fighting with sticks. The sticks, or lathi, are traditionally bamboo. A quick Google image search for ‘lathi’ displays a prevalence of images of bamboo sticks as a weapon for riot control in South Asia, rather than the South Asian martial art of lathi khela. The story of the gang is related in books, a Bollywood movie, and a documentary. There was an official website, but all that remains now are numerous dead cache links. I was not successful in locating a copy of the movie or documentary but you will find books about the Gulabi gang on both Amazon and eBay au. This entry was posted in All, Bamboo around the world and tagged bamboo, bamboo sticks, Gulabi Gang, India, lathi, lathi khela on 23/03/2014 by Deb.